For other uses, see Reincarnation (disambiguation). "Past lives" and "Transmigration of souls" redirect here. For other uses, see Past Lives (disambiguation). Reincarnation is the philosophical or religious concept that the non-physical essence of a living being starts a new life in a different physical form or body after biological death. It is also called rebirth or transmigration, and is a part of the Saṃsāra doctrine of cyclic existence. It is a central tenet of Indian religions, namely Jainism, Buddhism, Sikhism and Hinduism, although there are Hindu groups that do not believe in reincarnation but believe in an afterlife. A belief in rebirth/metempsychosis was held by Greek historic figures, such as Pythagoras, Socrates, and Plato. It is also a common belief of various ancient and modern religions such as Spiritism, Theosophy, and Eckankar, and as an esoteric belief in many streams of Orthodox Judaism. It is found as well in some tribal societies around the world, in places such as Australia and South America. The word "reincarnation" derives from Latin, literally meaning, "entering the flesh again". The Greek equivalent metempsychosis (μετεμψύχωσις) derives from meta (change) and empsykhoun (to put a soul into), a term attributed to Pythagoras. An alternate term is transmigration implying migration from one life (body) to another. Reincarnation refers to the belief that an aspect of every human being (or all living beings in some cultures) continues to exist after death, this aspect may be the soul or mind or consciousness or something transcendent which is reborn in an interconnected cycle of existence; the transmigration belief varies by culture, and is envisioned to be in the form of a newly born human being, or animal, or plant, or spirit, or as a being in some other non-human realm of existence. The term has been used by modern philosophers such as Kurt Gödel and has entered the English language. Another Greek term sometimes used synonymously is palingenesis, "being born again". Rebirth is a key concept found in major Indian religions, and discussed with various terms. Punarjanman (Sanskrit: पुनर्जन्मन्) means "rebirth, transmigration". Reincarnation is discussed in the ancient Sanskrit texts of Hinduism, Buddhism, and Jainism, with many alternate terms such as punarāvṛtti (पुनरावृत्ति), punarājāti (पुनराजाति), punarjīvātu (पुनर्जीवातु), punarbhava (पुनर्भव), āgati-gati (आगति-गति, common in Buddhist Pali text), nibbattin (निब्बत्तिन्), upapatti (उपपत्ति), and uppajjana (उप्पज्जन). These religions believe that this reincarnation is cyclic and an endless Saṃsāra, unless one gains spiritual insights that ends this cycle leading to liberation. The reincarnation concept is considered in Indian religions as a step that starts each "cycle of aimless drifting, wandering or mundane existence", but one that is an opportunity to seek spiritual liberation through ethical living and a variety of meditative, yogic (marga), or other spiritual practices. They consider the release from the cycle of reincarnations as the ultimate spiritual goal, and call the liberation by terms such as moksha, nirvana, mukti and kaivalya. However, the Buddhist, Hindu and Jain traditions have differed, since ancient times, in their assumptions and in their details on what reincarnates, how reincarnation occurs and what leads to liberation. Gilgul, Gilgul neshamot or Gilgulei Ha Neshamot (Heb. גלגול הנשמות) is the concept of reincarnation in Kabbalistic Judaism, found in much Yiddish literature among Ashkenazi Jews. Gilgul means "cycle" and neshamot is "souls". Kabbalistic reincarnation says that humans reincarnate only to humans unless YHWH/Ein Sof/God chooses. The origins of the notion of reincarnation are obscure. Discussion of the subject appears in the philosophical traditions of India. The Greek Pre-Socratics discussed reincarnation, and the Celtic Druids are also reported to have taught a doctrine of reincarnation. The idea of reincarnation did not exist in early Indian religions. The concepts of the cycle of birth and death, samsara, and liberation partly derive from ascetic traditions that possibly arose in India around the second half of the first millennium BCE. Though no direct evidence of this has been found, the tribes of the Ganges valley or the Dravidian traditions of South India have been proposed as another early source of reincarnation beliefs. But the religions of southern India, like the ancient historical Vedic religion in the North, the Dravidian folk religions do not have the concept of reincarnation. The Vedas, does not mention the doctrine of Karma and rebirth but mention the belief in an afterlife. It is in the early Upanishads, which are pre-Buddha and pre-Mahavira, where these ideas are beginning to develope. Detailed descriptions first appear around the mid 1st millennium BCE in diverse traditions, including Buddhism, Jainism and various schools of Hindu philosophy, each of which gave unique expression to the general principle. The texts of ancient Jainism that have survived into the modern era are post-Mahavira, likely from the last centuries of the 1st millennium BCE, and extensively mention rebirth and karma doctrines. The Jaina philosophy assumes that the soul (Jiva in Jainism, Atman in Hinduism) exists and is eternal, passing through cycles of transmigration and rebirth. After death, reincarnation into a new body is asserted to be instantaneous in early Jaina texts. Depending upon the accumulated karma, rebirth occurs into a higher or lower bodily form, either in heaven or hell or earthly realm. No bodily form is permanent: everyone dies and reincarnates further. Liberation (kevalya) from reincarnation is possible, however, through removing and ending karmic accumulations to one's soul. From the early stages of Jainism on, a human being was considered the highest mortal being, with the potential to achieve liberation, particularly through asceticism. The early Buddhist texts discuss rebirth as part of the doctrine of Saṃsāra. This asserts that the nature of existence is a "suffering-laden cycle of life, death, and rebirth, without beginning or end". Also referred to as the wheel of existence (Bhavacakra), it is often mentioned in Buddhist texts with the term punarbhava (rebirth, re-becoming). Liberation from this cycle of existence, Nirvana, is the foundation and the most important purpose of Buddhism. Buddhist texts also assert that an enlightened person knows his previous births, a knowledge achieved through high levels of meditative concentration. Tibetan Buddhism discusses death, bardo (an intermediate state), and rebirth in texts such as the Tibetan Book of the Dead. While Nirvana is taught as the ultimate goal in the Theravadin Buddhism, and is essential to Mahayana Buddhism, the vast majority of contemporary lay Buddhists focus on accumulating good karma and acquiring merit to achieve a better reincarnation in the next life. In early Buddhist traditions, Saṃsāra cosmology consisted of five realms through which the wheel of existence cycled. This included hells (niraya), hungry ghosts (pretas), animals (tiryak), humans (manushya), and gods (devas, heavenly). In latter Buddhist traditions, this list grew to a list of six realms of rebirth, adding demi-gods (asuras). The earliest layers of Vedic text incorporate the concept of life, followed by an afterlife in heaven and hell based on cumulative virtues (merit) or vices (demerit). However, the ancient Vedic Rishis challenged this idea of afterlife as simplistic, because people do not live an equally moral or immoral life. Between generally virtuous lives, some are more virtuous; while evil too has degrees, and the texts assert that it would be unfair for people, with varying degrees of virtue or vices, to end up in heaven or hell, in "either or" and disproportionate manner irrespective of how virtuous or vicious their lives were. They introduced the idea of an afterlife in heaven or hell in proportion to one's merit. Early texts of Hinduism, Buddhism and Jainism share the concepts and terminology related to reincarnation. They also emphasize similar virtuous practices and karma as necessary for liberation and what influences future rebirths. For example, all three discuss various virtues – sometimes grouped as Yamas and Niyamas – such as non-violence, truthfulness, non-stealing, non-possessiveness, compassion for all living beings, charity and many others. Hinduism, Buddhism and Jainism disagree in their assumptions and theories about rebirth. Hinduism relies on its foundational assumption that "soul, Self exists" (Atman, attā), in contrast to Buddhist assumption that there is "no soul, no Self" (Anatta, anatman). Hindu traditions consider soul to be the unchanging eternal essence of a living being, and what journeys across reincarnations until it attains self-knowledge. Buddhism, in contrast, asserts a rebirth theory without a Self, and considers realization of non-Self or Emptiness as Nirvana (nibbana). Thus Buddhism and Hinduism have a very different view on whether a self or soul exists, which impacts the details of their respective rebirth theories. The reincarnation doctrine in Jainism differs from those in Buddhism, even though both are non-theistic Sramana traditions. Jainism, in contrast to Buddhism, accepts the foundational assumption that soul exists (Jiva) and asserts this soul is involved in the rebirth mechanism. Further, Jainism considers asceticism as an important means to spiritual liberation that ends all reincarnation, while Buddhism does not. A 2nd-century Roman sarcophagus shows the mythology and symbolism of the Orphic and Dionysiac Mystery schools. Orpheus plays his lyre to the left. Early Greek discussion of the concept likewise dates to the 6th century BCE. An early Greek thinker known to have considered rebirth is Pherecydes of Syros (fl. 540 BCE). His younger contemporary Pythagoras (c. 570–c. 495 BCE), its first famous exponent, instituted societies for its diffusion. Plato (428/427–348/347 BCE) presented accounts of reincarnation in his works, particularly the Myth of Er. Authorities have not agreed on how the notion arose in Greece: sometimes Pythagoras is said to have been Pherecydes' pupil, sometimes to have introduced it with the doctrine of Orphism, a Thracian religion that was to be important in the diffusion of reincarnation, or else to have brought the teaching from India. In Phaedo, Plato makes his teacher Socrates, prior to his death, state: "I am confident that there truly is such a thing as living again, and that the living spring from the dead." However Xenophon does not mention Socrates as believing in reincarnation and Plato may have systematised Socrates' thought with concepts he took directly from Pythagoreanism or Orphism. The Orphic religion, which taught reincarnation, about the 6th century BC, organized itself into mystery schools at Eleusis and elsewhere, and produced a copious literature. Orpheus, its legendary founder, is said to have taught that the immortal soul aspires to freedom while the body holds it prisoner. The wheel of birth revolves, the soul alternates between freedom and captivity round the wide circle of necessity. Orpheus proclaimed the need of the grace of the gods, Dionysus in particular, and of self-purification until the soul has completed the spiral ascent of destiny to live for ever. An association between Pythagorean philosophy and reincarnation was routinely accepted throughout antiquity. In the Republic Plato makes Socrates tell how Er, the son of Armenius, miraculously returned to life on the twelfth day after death and recounted the secrets of the other world. There are myths and theories to the same effect in other dialogues, in the Chariot allegory of the Phaedrus, in the Meno, Timaeus and Laws. The soul, once separated from the body, spends an indeterminate amount of time in "formland" (see The Allegory of the Cave in The Republic) and then assumes another body. In later Greek literature the doctrine is mentioned in a fragment of Menander and satirized by Lucian. In Roman literature it is found as early as Ennius, who, in a lost passage of his Annals, told how he had seen Homer in a dream, who had assured him that the same soul which had animated both the poets had once belonged to a peacock. Persius in his satires (vi. 9) laughs at this, it is referred to also by Lucretius and Horace. Virgil works the idea into his account of the Underworld in the sixth book of the Aeneid. It persists down to the late classic thinkers, Plotinus and the other Neoplatonists. In the Hermetica, a Graeco-Egyptian series of writings on cosmology and spirituality attributed to Hermes Trismegistus/Thoth, the doctrine of reincarnation is central. In Greco-Roman thought, the concept of metempsychosis disappeared with the rise of Early Christianity, reincarnation being incompatible with the Christian core doctrine of salvation of the faithful after death. It has been suggested that some of the early Church Fathers, especially Origen, still entertained a belief in the possibility of reincarnation, but evidence is tenuous, and the writings of Origen as they have come down to us speak explicitly against it. Some early Christian Gnostic sects professed reincarnation. The Sethians and followers of Valentinus believed in it. The followers of Bardaisan of Mesopotamia, a sect of the 2nd century deemed heretical by the Catholic Church, drew upon Chaldean astrology, to which Bardaisan's son Harmonius, educated in Athens, added Greek ideas including a sort of metempsychosis. Another such teacher was Basilides (132–? CE/AD), known to us through the criticisms of Irenaeus and the work of Clement of Alexandria (see also Neoplatonism and Gnosticism and Buddhism and Gnosticism). In the third Christian century Manichaeism spread both east and west from Babylonia, then within the Sassanid Empire, where its founder Mani lived about 216–276. Manichaean monasteries existed in Rome in 312 AD. Noting Mani's early travels to the Kushan Empire and other Buddhist influences in Manichaeism, Richard Foltz attributes Mani's teaching of reincarnation to Buddhist influence. However the inter-relation of Manicheanism, Orphism, Gnosticism and neo-Platonism is far from clear. The Pythagorean doctrine prevails among the Gauls' teaching that the souls of men are immortal, and that after a fixed number of years they will enter into another body. The principal point of their doctrine is that the soul does not die and that after death it passes from one body into another... the main object of all education is, in their opinion, to imbue their scholars with a firm belief in the indestructibility of the human soul, which, according to their belief, merely passes at death from one tenement to another; for by such doctrine alone, they say, which robs death of all its terrors, can the highest form of human courage be developed. Surviving North Germanic texts make several references to beliefs in reincarnation. The Poetic Edda poem Helgakviða Hundingsbana II states that belief in reincarnation was once widespread, but was at the time of the composition restricted to folk belief. In addition, scholars have identified a variety of references to reincarnation among the Germanic peoples outside the North Germanic sphere. The belief in reincarnation had first existed amongst Jewish mystics in the Ancient World, among whom differing explanations were given of the after-life, although with a universal belief in an immortal soul. Today, reincarnation is an esoteric belief within many streams of modern Judaism. Kabbalah (Jewish mysticism), teaches a belief in gilgul, transmigration of souls, and hence the belief in reincarnation is universal in Hasidic Judaism, which regards the Kabbalah as sacred and authoritative, and is also held as an esoteric belief within Modern Orthodox Judaism. In Judaism, the Zohar, first published in the 13th century, discusses reincarnation at length, especially in the Torah portion "Balak." The most comprehensive kabbalistic work on reincarnation, Shaar HaGilgulim, was written by Chaim Vital, based on the teachings of his mentor, the 16th century kabbalist Isaac Luria, who was said to know the past lives of each person through his semi-prophetic abilities. The 18th century Lithuanian master scholar and kabbalist, Rabbi Elijah, known as the Vilna Gaon (Elijah of Vilna), authored a commentary on the biblical Book of Jonah as an allegory of reincarnation. The practice of conversion to Judaism is sometimes understood within Orthodox Judaism in terms of reincarnation. According to this school of thought in Judaism, when non-Jews are drawn to Judaism, it is because they had been Jews in a former life. Such souls may "wander among nations" through multiple lives, until they find their way back to Judaism, including through finding themselves born in a gentile family with a "lost" Jewish ancestor. There is an extensive literature of Jewish folk and traditional stories that refer to reincarnation. Around the 11–12th century in Europe, several reincarnationist movements were persecuted as heresies, through the establishment of the Inquisition in the Latin west. These included the Cathar, Paterene or Albigensian church of western Europe, the Paulician movement, which arose in Armenia, and the Bogomils in Bulgaria. Christian sects such as the Bogomils and the Cathars, who professed reincarnation and other gnostic beliefs, were referred to as "Manichean", and are today sometimes described by scholars as "Neo-Manichean". As there is no known Manichaean mythology or terminology in the writings of these groups there has been some dispute among historians as to whether these groups truly were descendants of Manichaeism. While reincarnation has been a matter of faith in some communities from an early date it has also frequently been argued for on principle, as Plato does when he argues that the number of souls must be finite because souls are indestructible, Benjamin Franklin held a similar view. Sometimes such convictions, as in Socrates' case, arise from a more general personal faith, at other times from anecdotal evidence such as Plato makes Socrates offer in the Myth of Er. During the Renaissance translations of Plato, the Hermetica and other works fostered new European interest in reincarnation. Marsilio Ficino argued that Plato's references to reincarnation were intended allegorically, Shakespeare alluded to the doctrine of reincarnation but Giordano Bruno was burned at the stake by authorities after being found guilty of heresy by the Roman Inquisition for his teachings. But the Greek philosophical works remained available and, particularly in north Europe, were discussed by groups such as the Cambridge Platonists. American psychologist and philosopher William James (1842–1910) was an early psychical researcher. By the 19th century the philosophers Schopenhauer and Nietzsche could access the Indian scriptures for discussion of the doctrine of reincarnation, which recommended itself to the American Transcendentalists Henry David Thoreau, Walt Whitman and Ralph Waldo Emerson and was adapted by Francis Bowen into Christian Metempsychosis. By the early 20th century, interest in reincarnation had been introduced into the nascent discipline of psychology, largely due to the influence of William James, who raised aspects of the philosophy of mind, comparative religion, the psychology of religious experience and the nature of empiricism. James was influential in the founding of the American Society for Psychical Research (ASPR) in New York City in 1885, three years after the British Society for Psychical Research (SPR) was inaugurated in London, leading to systematic, critical investigation of paranormal phenomena. Famous World War II American General George Patton was a strong believer in reincarnation, believing, among other things, he was a reincarnation of the Carthaginian General Hannibal. At this time popular awareness of the idea of reincarnation was boosted by the Theosophical Society's dissemination of systematised and universalised Indian concepts and also by the influence of magical societies like The Golden Dawn. Notable personalities like Annie Besant, W. B. Yeats and Dion Fortune made the subject almost as familiar an element of the popular culture of the west as of the east. By 1924 the subject could be satirised in popular children's books. Humorist Don Marquis created a fictional cat named Mehitabel who claimed to be a reincarnation of Queen Cleopatra. Théodore Flournoy was among the first to study a claim of past-life recall in the course of his investigation of the medium Hélène Smith, published in 1900, in which he defined the possibility of cryptomnesia in such accounts.Carl Gustav Jung, like Flournoy based in Switzerland, also emulated him in his thesis based on a study of cryptomnesia in psychism. Later Jung would emphasise the importance of the persistence of memory and ego in psychological study of reincarnation: "This concept of rebirth necessarily implies the continuity of personality... (that) one is able, at least potentially, to remember that one has lived through previous existences, and that these existences were one's own...." Hypnosis, used in psychoanalysis for retrieving forgotten memories, was eventually tried as a means of studying the phenomenon of past life recall. The body dies, assert the Hindu traditions, but not the soul, which they assume to be the eternal reality, indestructible and bliss. Everything and all existence is believed to be connected and cyclical in many Hinduism-sects, all living beings composed of two things, the soul and the body or matter. Atman does not change and cannot change by its innate nature in the Hindu belief. Current Karma impacts the future circumstances in this life, as well as the future forms and realms of lives. Good intent and actions lead to good future, bad intent and actions lead to bad future, impacting how one reincarnates, in the Hindu view of existence. Hindus believe the self or soul (atman) repeatedly takes on a physical body, until moksha. There is no permanent heaven or hell in most Hinduism-sects. In the afterlife, based on one's karma, the soul is reborn as another being in heaven, hell, or a living being on earth (human, animal). Gods too die once their past karmic merit runs out, as do those in hell, and they return getting another chance on earth. This reincarnation continues, endlessly in cycles, until one embarks on a spiritual pursuit, realizes self-knowledge, and thereby gains mokṣa, the final release out of the reincarnation cycles. This release is believed to be a state of utter bliss, which Hindu traditions believe is either related or identical to Brahman, the unchanging reality that existed before the creation of universe, continues to exist, and shall exist after the universe ends. The Upanishads, part of the scriptures of the Hindu traditions, primarily focus on the liberation from reincarnation. The Bhagavad Gita discusses various paths to liberation. The Upanishads, states Harold Coward, offer a "very optimistic view regarding the perfectibility of human nature", and the goal of human effort in these texts is a continuous journey to self-perfection and self-knowledge so as to end Saṃsāra – the endless cycle of rebirth and redeath. The aim of spiritual quest in the Upanishadic traditions is find the true self within and to know one's soul, a state that it believes leads to blissful state of freedom, moksha. There are internal differences within Hindu traditions on reincarnation and the state of moksha. For example, the dualistic devotional traditions such as Madhvacharya's Dvaita Vedanta tradition of Hinduism champion a theistic premise, assert that human soul and Brahman are different, loving devotion to Brahman (god Vishnu in Madhvacharya's theology) is the means to release from Samsara, it is the grace of God which leads to moksha, and spiritual liberation is achievable only in after-life (videhamukti). The nondualistic traditions such as Adi Shankara's Advaita Vedanta tradition of Hinduism champion a monistic premise, asserting that the individual human soul and Brahman are identical, only ignorance, impulsiveness and inertia leads to suffering through Saṃsāra, in reality they are no dualities, meditation and self-knowledge is the path to liberation, the realization that one's soul is identical to Brahman is moksha, and spiritual liberation is achievable in this life (jivanmukti). In this 8-meter (25-foot) tall Buddhist relief, made between 1177 and 1249, Mara, Lord of Death and Desire, clutches a Wheel of Reincarnation which outlines the Buddhist cycle of reincarnation. The Buddha also asserted that karma influences rebirth, and that the cycles of repeated births and deaths are endless. Before the birth of Buddha, ancient Indian scholars had developed competing theories of afterlife, including the materialistic school such as Charvaka, which posited that death is the end, there is no afterlife, no soul, no rebirth, no karma, and they described death to be a state where a living being is completely annihilated, dissolved. Buddha rejected this theory, adopted the alternate existing theories on rebirth, criticizing the materialistic schools that denied rebirth and karma, states Damien Keown. Such beliefs are inappropriate and dangerous, stated Buddha, because such annihilationism views encourage moral irresponsibility and material hedonism; he tied moral responsibility to rebirth. The Buddha introduced the concept that there is no permanent self (soul), and this central concept in Buddhism is called anattā. Major contemporary Buddhist traditions such as Theravada, Mahayana and Vajrayana traditions accept the teachings of Buddha. These teachings assert there is rebirth, there is no permanent self and no irreducible ātman (soul) moving from life to another and tying these lives together, there is impermanence, that all compounded things such as living beings are aggregates dissolve at death, but every being reincarnates. The rebirth cycles continue endlessly, states Buddhism, and it is a source of Dukkha (suffering, pain), but this reincarnation and Dukkha cycle can be stopped through nirvana. The anattā doctrine of Buddhism is a contrast to Hinduism, the latter asserting that "soul exists, it is involved in rebirth, and it is through this soul that everything is connected". Different traditions within Buddhism have offered different theories on what reincarnates and how reincarnation happens. One theory suggests that it occurs through consciousness (Pali: samvattanika-viññana) or stream of consciousness (Pali: viññana-sotam, Sanskrit: vijñāna-srotām, vijñāna-santāna, or citta-santāna) upon death, which reincarnates into a new aggregation. This process, states this theory, is similar to the flame of a dying candle lighting up another. The consciousness in the newly born being is neither identical to nor entirely different from that in the deceased but the two form a causal continuum or stream in this Buddhist theory. Transmigration is influenced by a being's past karma (kamma). The root cause of rebirth, states Buddhism, is the abiding of consciousness in ignorance (Pali: avijja, Sanskrit: avidya) about the nature of reality, and when this ignorance is uprooted, rebirth ceases. Buddhist traditions also vary in their mechanistic details on rebirth. Theravada Buddhists assert that rebirth is immediate while the Tibetan schools hold to the notion of a bardo (intermediate state) that can last up to 49 days. The bardo rebirth concept of Tibetan Buddhism, along with yidam, developed independently in Tibet without Indian influence, and involves 42 peaceful deities, and 58 wrathful deities. These ideas led to mechanistic maps on karma and what form of rebirth one takes after death, discussed in texts such as The Tibetan Book of the Dead. The major Buddhist traditions accept that the reincarnation of a being depends on the past karma and merit (demerit) accumulated, and that there are six realms of existence in which the rebirth may occur after each death. Within Japanese Zen, reincarnation is accepted by some, but rejected by others. A distinction can be drawn between "folk Zen", as in the Zen practiced by devotional lay people, and "philosophical Zen". Folk Zen generally accepts the various supernatural elements of Buddhism such as rebirth. Philosophical Zen, however, places more emphasis on the present moment. Some schools conclude that karma continues to exist and adhere to the person until it works out its consequences. For the Sautrantika school, each act "perfumes" the individual or "plants a seed" that later germinates. Tibetan Buddhism stresses the state of mind at the time of death. To die with a peaceful mind will stimulate a virtuous seed and a fortunate rebirth; a disturbed mind will stimulate a non-virtuous seed and an unfortunate rebirth. 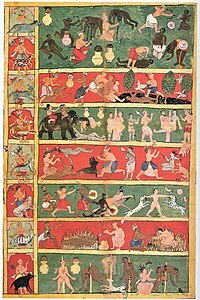 17th-century cloth painting depicting seven levels of Jain hell according to Jain cosmology. Left panel depicts the demi-god and his animal vehicle presiding over each hell. In Jainism, the reincarnation doctrine, along with its theories of Saṃsāra and Karma, are central to its theological foundations, as evidenced by the extensive literature on it in the major sects of Jainism, and their pioneering ideas on these topics from the earliest times of the Jaina tradition. 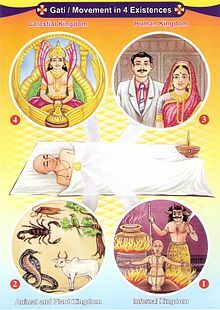 Reincarnation in contemporary Jainism traditions is the belief that the worldly life is characterized by continuous rebirths and suffering in various realms of existence. Karma forms a central and fundamental part of Jain faith, being intricately connected to other of its philosophical concepts like transmigration, reincarnation, liberation, non-violence (ahiṃsā) and non-attachment, among others. Actions are seen to have consequences: some immediate, some delayed, even into future incarnations. So the doctrine of karma is not considered simply in relation to one life-time, but also in relation to both future incarnations and past lives. Uttarādhyayana-sūtra 3.3–4 states: "The jīva or the soul is sometimes born in the world of gods, sometimes in hell. Sometimes it acquires the body of a demon; all this happens on account of its karma. This jīva sometimes takes birth as a worm, as an insect or as an ant." The text further states (32.7): "Karma is the root of birth and death. The souls bound by karma go round and round in the cycle of existence." Actions and emotions in the current lifetime affect future incarnations depending on the nature of the particular karma. For example, a good and virtuous life indicates a latent desire to experience good and virtuous themes of life. Therefore, such a person attracts karma that ensures that his future births will allow him to experience and manifest his virtues and good feelings unhindered. In this case, he may take birth in heaven or in a prosperous and virtuous human family. On the other hand, a person who has indulged in immoral deeds, or with a cruel disposition, indicates a latent desire to experience cruel themes of life. As a natural consequence, he will attract karma which will ensure that he is reincarnated in hell, or in lower life forms, to enable his soul to experience the cruel themes of life. There is no retribution, judgment or reward involved but a natural consequences of the choices in life made either knowingly or unknowingly. Hence, whatever suffering or pleasure that a soul may be experiencing in its present life is on account of choices that it has made in the past. As a result of this doctrine, Jainism attributes supreme importance to pure thinking and moral behavior. The Jain texts postulate four gatis, that is states-of-existence or birth-categories, within which the soul transmigrates. The four gatis are: deva (demi-gods), manuṣya (humans), nāraki (hell beings) and tiryañca (animals, plants and micro-organisms). The four gatis have four corresponding realms or habitation levels in the vertically tiered Jain universe: demi-gods occupy the higher levels where the heavens are situated; humans, plants and animals occupy the middle levels; and hellish beings occupy the lower levels where seven hells are situated. Single-sensed souls, however, called nigoda, and element-bodied souls pervade all tiers of this universe. Nigodas are souls at the bottom end of the existential hierarchy. They are so tiny and undifferentiated, that they lack even individual bodies, living in colonies. According to Jain texts, this infinity of nigodas can also be found in plant tissues, root vegetables and animal bodies. Depending on its karma, a soul transmigrates and reincarnates within the scope of this cosmology of destinies. The four main destinies are further divided into sub-categories and still smaller sub-sub-categories. In all, Jain texts speak of a cycle of 8.4 million birth destinies in which souls find themselves again and again as they cycle within samsara. In Jainism, God has no role to play in an individual's destiny; one's personal destiny is not seen as a consequence of any system of reward or punishment, but rather as a result of its own personal karma. A text from a volume of the ancient Jain canon, Bhagvati sūtra 8.9.9, links specific states of existence to specific karmas. Violent deeds, killing of creatures having five sense organs, eating fish, and so on, lead to rebirth in hell. Deception, fraud and falsehood lead to rebirth in the animal and vegetable world. Kindness, compassion and humble character result in human birth; while austerities and the making and keeping of vows lead to rebirth in heaven. Each soul is thus responsible for its own predicament, as well as its own salvation. Accumulated karma represent a sum total of all unfulfilled desires, attachments and aspirations of a soul. It enables the soul to experience the various themes of the lives that it desires to experience. Hence a soul may transmigrate from one life form to another for countless of years, taking with it the karma that it has earned, until it finds conditions that bring about the required fruits. In certain philosophies, heavens and hells are often viewed as places for eternal salvation or eternal damnation for good and bad deeds. But according to Jainism, such places, including the earth are simply the places which allow the soul to experience its unfulfilled karma. Jewish mystical texts (the Kabbalah), from their classic Medieval canon onward, teach a belief in Gilgul Neshamot (Hebrew for metempsychosis of souls: literally "soul cycle", plural "gilgulim"). The Zohar and the Sefer HaBahir specifically discuss reincarnation. It is a common belief in contemporary Hasidic Judaism, which regards the Kabbalah as sacred and authoritative, though understood in light of a more innate psychological mysticism. Kabbalah also teaches that "The soul of Moses is reincarnated in every generation." Other, Non-Hasidic, Orthodox Jewish groups while not placing a heavy emphasis on reincarnation, do acknowledge it as a valid teaching. Its popularization entered modern secular Yiddish literature and folk motif. The 16th century mystical renaissance in communal Safed replaced scholastic Rationalism as mainstream traditional Jewish theology, both in scholarly circles and in the popular imagination. References to gilgul in former Kabbalah became systematized as part of the metaphysical purpose of creation. Isaac Luria (the Ari) brought the issue to the centre of his new mystical articulation, for the first time, and advocated identification of the reincarnations of historic Jewish figures that were compiled by Haim Vital in his Shaar HaGilgulim. Gilgul is contrasted with the other processes in Kabbalah of Ibbur ("pregnancy"), the attachment of a second soul to an individual for (or by) good means, and Dybuk ("possession"), the attachment of a spirit, demon, etc. to an individual for (or by) "bad" means. In Lurianic Kabbalah, reincarnation is not retributive or fatalistic, but an expression of Divine compassion, the microcosm of the doctrine of cosmic rectification of creation. Gilgul is a heavenly agreement with the individual soul, conditional upon circumstances. Luria's radical system focused on rectification of the Divine soul, played out through Creation. The true essence of anything is the divine spark within that gives it existence. Even a stone or leaf possesses such a soul that "came into this world to receive a rectification". A human soul may occasionally be exiled into lower inanimate, vegetative or animal creations. The most basic component of the soul, the nefesh, must leave at the cessation of blood production. There are four other soul components and different nations of the world possess different forms of souls with different purposes. Each Jewish soul is reincarnated in order to fulfill each of the 613 Mosaic commandments that elevate a particular spark of holiness associated with each commandment. Once all the Sparks are redeemed to their spiritual source, the Messianic Era begins. Non-Jewish observance of the 7 Laws of Noah assists the Jewish people, though Biblical adversaries of Israel reincarnate to oppose. Among the many rabbis who accepted reincarnation are Nahmanides (the Ramban) and Rabbenu Bahya ben Asher, Levi ibn Habib (the Ralbah), Shelomoh Alkabez, Moses Cordovero, Moses Chaim Luzzatto; early Hasidic masters such as the Baal Shem Tov, Schneur Zalman of Liadi and Nachman of Breslov, as well as virtually all later Hasidic masters; contemporary Hasidic teachers such as DovBer Pinson, Moshe Weinberger and Joel Landau; and key Mitnagdic leaders, such as the Vilna Gaon and Chaim Volozhin and their school, as well as Rabbi Shalom Sharabi (known at the RaShaSH), the Ben Ish Chai of Baghdad, and the Baba Sali. Rabbis who have rejected the idea include Saadia Gaon, David Kimhi, Hasdai Crescas, Joseph Albo, Abraham ibn Daud, Leon de Modena, Solomon ben Aderet, Maimonides and Asher ben Jehiel. Among the Geonim, Hai Gaon argued in favour of gilgulim. Founded in the 15th century, Sikhism's founder Guru Nanak had a choice between the cyclical reincarnation concept of ancient Indian religions and the linear concept of early 7th-century Islam, and he chose the cyclical concept of time. Sikhism teaches reincarnation theory similar to those in Hinduism, but with some differences from its traditional doctrines. Sikh rebirth theories about the nature of existence are similar to ideas that developed during the devotional Bhakti movement particularly within some Vaishnavism traditions, which define liberation as a state of union with God attained through the grace of God. The doctrines of Sikhism teach that the soul exists, and is passed from one body to another in endless cycles of Saṃsāra, until liberation. Each birth begins with karma (karam), and these actions leave a karni (karmic signature) on one's soul which influences future rebirths, but it is God whose grace that liberates. The way out of the reincarnation cycle, asserts Sikhism, is to live an ethical life, devote oneself to God and constantly remember God's name. The precepts of Sikhism encourage the bhakti of One Lord for mukti (liberation). The Yoruba believe in reincarnation within the family. The names Babatunde (Father returns), Yetunde (Mother returns), Babatunji (Father wakes once again) and Sotunde (The wise man returns) all offer vivid evidence of the Ifa concept of familial or lineal rebirth. There is no simple guarantee that your grandfather or great uncle will "come back" in the birth of your child, however. Whenever the time arrives for a spirit to return to Earth (otherwise known as The Marketplace) through the conception of a new life in the direct bloodline of the family, one of the component entities of a person's being returns, while the other remains in Heaven (Ikole Orun). The spirit that returns does so in the form of a Guardian Ori. One's Guardian Ori, which is represented and contained in the crown of the head, represents not only the spirit and energy of one's previous blood relative, but the accumulated wisdom he or she has acquired through a myriad of lifetimes. This is not to be confused with one’s spiritual Ori, which contains personal destiny, but instead refers to the coming back to The Marketplace of one's personal blood Ori through one's new life and experiences. Reincarnation is an intrinsic part of some northen Native American and Inuit traditions. In the now heavily Christian Polar North (now mainly parts of Greenland and Nunavut), the concept of reincarnation is enshrined in the Inuit language. The following is a story of human-to-human reincarnation as told by Thunder Cloud, a Winnebago (Ho-Chunk tribe) shaman referred to as T. C. in the narrative. Here T. C. talks about his two previous lives and how he died and came back again to this his third lifetime. He describes his time between lives, when he was “blessed” by Earth Maker and all the abiding spirits and given special powers, including the ability to heal the sick. In the major Christian denominations, the concept of reincarnation is absent and it is nowhere explicitly referred to in the Bible. However, in a survey by the Pew Forum in 2009, 24% of American Christians expressed a belief in reincarnation and in a 1981 survey 31% of regular churchgoing European Catholics expressed a belief in reincarnation. Some Christian theologians interpret certain Biblical passages as referring to reincarnation. These passages include the questioning of Jesus as to whether he is Elijah, John the Baptist, Jeremiah, or another prophet (Matthew 16:13-15 and John 1:21-22) and, less clearly (while Elijah was said not to have died, but to have been taken up to heaven), John the Baptist being asked if he is not Elijah (John 1:25).. Geddes MacGregor, an Episcopalian priest and professor of philosophy, has made a case for the compatibility of Christian doctrine and reincarnation. About ten years ago that saintly man Pammachius sent me a copy of a certain person's [ Rufinus's ] rendering, or rather misrendering, of Origen's First Principles; with a request that in a Latin version I should give the true sense of the Greek and should set down the writer's words for good or for evil without bias in either direction. When I did as he wished and sent him the book, he was shocked to read it and locked it up in his desk lest being circulated it might wound the souls of many. The original text of On First Principles has almost completely disappeared. It remains extant as De Principiis in fragments faithfully translated into Latin by St. Jerome and in "the not very reliable Latin translation of Rufinus." The doctrine of reincarnation was rejected by Augustine of Hippo in The City of God. Islamic scriptures reject any idea of reincarnation of human beings or God. It teaches a linear concept of life, wherein a human being has only one life and upon death he or she is judged by God, then rewarded in heaven or punished in hell. Islam teaches final resurrection and Judgement Day, but there is no prospect for the reincarnation of a human being into a different body or being. During the early history of Islam, some of the Caliphs persecuted all reincarnation-believing people to the point of extinction (Manichaeism) in Mesopotamia and Persia (modern day Iraq and Iran). However, some Muslim minority sects such as those found among Sufis, and some Muslims in South Asia and Indonesia have retained their pre-Islamic Hindu and Buddhist beliefs in reincarnation. For instance, historically, South Asian Isma'ilis performed chantas yearly, one of which is for seeking forgiveness of sins committed in past lives. The idea of reincarnation is accepted by a few Shia Muslim sects, particularly of the Ghulat. Alawis, belonging to the Shia denomination of Islam, hold that they were originally stars or divine lights that were cast out of heaven through disobedience and must undergo repeated reincarnation (or metempsychosis) before returning to heaven. They can be reincarnated as Christians or others through sin and as animals if they become infidels. Reincarnation was also accepted by some streams of Sufism. Modern Sufis who embrace the idea include Bawa Muhaiyadeen. However Inayat Khan has criticized the idea as unhelpful to the spiritual seeker. Reincarnation is a paramount tenet in the Druze faith. There is an eternal duality of the body and the soul and it is impossible for the soul to exist without the body. Therefore, reincarnations occur instantly at one's death. While in the Hindu and Buddhist belief system a soul can be transmitted to any living creature, in the Druze belief system this is not possible and a human soul will only transfer to a human body. Furthermore, a male Druze can only be reincarnated as another male Druze and a female Druze can only be reincarnated as another female Druze. Additionally, souls cannot be divided and the number of souls existing is finite. Very few Druzes are able to recall their past but, if they are able to they are called a Nateq. Typically souls who have died violent deaths in their previous incarnation will be able to recall memories. Since death is seen as a quick transient state, mourning is discouraged. Unlike other Abrahamic faiths, heaven and hell are spiritual. Heaven is the ultimate happiness received when soul escapes the cycle of rebirths and reunites with the Creator, while hell is conceptualized as the bitterness of being unable to reunite with the Creator and escape from the cycle of rebirth. Tomb of Allan Kardec, founder of spiritism. The inscription says in French "To be born, die, again be reborn, and so progress unceasingly, such is the law". Spiritism, a Christian philosophy codified in the 19th century by the French educator Allan Kardec, teaches reincarnation or rebirth into human life after death. According to this doctrine, free will and cause and effect are the corollaries of reincarnation, and reincarnation provides a mechanism for man's spiritual evolution in successive lives. The Theosophical Society draws much of its inspiration from India. The idea is, according to a recent Theosophical writer, "the master-key to modern problems", including heredity. In the Theosophical world-view reincarnation is the vast rhythmic process by which the soul, the part of a person which belongs to the formless non-material and timeless worlds, unfolds its spiritual powers in the world and comes to know itself. It descends from sublime, free, spiritual realms and gathers experience through its effort to express itself in the world. Afterwards there is a withdrawal from the physical plane to successively higher levels of reality, in death, a purification and assimilation of the past life. Having cast off all instruments of personal experience it stands again in its spiritual and formless nature, ready to begin its next rhythmic manifestation, every lifetime bringing it closer to complete self-knowledge and self-expression. However it may attract old mental, emotional, and energetic karma patterns to form the new personality. Inspired by Helena Blavatsky's major works, including Isis Unveiled and The Secret Doctrine, astrologers in the early twentieth-century integrated the concepts of karma and reincarnation into the practice of Western astrology. Notable astrologers who advanced this development included Alan Leo, Charles E. O. Carter, Marc Edmund Jones, and Dane Rudhyar. A new synthesis of East and West resulted as Hindu and Buddhist concepts of reincarnation were fused with Western astrology's deep roots in Hermeticism and Neoplatonism. In the case of Rudhyar, this synthesis was enhanced with the addition of Jungian depth psychology. This dynamic integration of astrology, reincarnation and depth psychology has continued into the modern era with the work of astrologers Steven Forrest and Jeffrey Wolf Green. Their respective schools of Evolutionary Astrology are based on "an acceptance of the fact that human beings incarnate in a succession of lifetimes." Anthroposophy describes reincarnation from the point of view of Western philosophy and culture. The ego is believed to transmute transient soul experiences into universals that form the basis for an individuality that can endure after death. These universals include ideas, which are intersubjective and thus transcend the purely personal (spiritual consciousness), intentionally formed human character (spiritual life), and becoming a fully conscious human being (spiritual humanity). Rudolf Steiner described both the general principles he believed to be operative in reincarnation, such as that one's will activity in one life forms the basis for the thinking of the next, and a number of successive lives of various individualities. Past reincarnation, usually termed "past lives", is a key part of the principles and practices of the Church of Scientology. Scientologists believe that the human individual is actually a thetan, an immortal spiritual entity, that has fallen into a degraded state as a result of past-life experiences. Scientology auditing is intended to free the person of these past-life traumas and recover past-life memory, leading to a higher state of spiritual awareness. This idea is echoed in their highest fraternal religious order, the Sea Organization, whose motto is "Revenimus" or "We Come Back", and whose members sign a "billion-year contract" as a sign of commitment to that ideal. L. Ron Hubbard, the founder of Scientology, does not use the word "reincarnation" to describe its beliefs, noting that: "The common definition of reincarnation has been altered from its original meaning. The word has come to mean 'to be born again in different life forms' whereas its actual definition is 'to be born again into the flesh of another body.' Scientology ascribes to this latter, original definition of reincarnation." The first writings in Scientology regarding past lives date from around 1951 and slightly earlier. In 1960, Hubbard published a book on past lives entitled Have You Lived Before This Life. In 1968 he wrote Mission into Time, a report on a five-week sailing expedition to Sardinia, Sicily and Carthage to see if specific evidence could be found to substantiate L. Ron Hubbard's recall of incidents in his own past, centuries ago. The Indian spiritual teacher Meher Baba stated that reincarnation occurs due to desires and once those desires are extinguished the ego-mind ceases to reincarnate. Wicca is a neo-pagan religion focused on nature, guided by the philosophy of Wiccan Rede that advocates the tenets "Harm None, Do As Ye Will". Wiccans believe in a form of karmic return where one's deeds are returned, either in the current life or in another life, threefold or multiple times in order to teach one lessons (The Threefold Law). Reincarnation is therefore an accepted part of the Wiccan faith. [full citation needed] Wiccans also believe that death and afterlife are important experiences for the soul to transform and prepare for future lifetimes. During recent decades, many people in the West have developed an interest in reincarnation. Recent studies have indicated that some Westerners accept the idea of reincarnation including certain contemporary people who were from Catholic families, modern Neopagans, followers of Spiritism, Theosophists and students of esoteric philosophies such as Kabbalah, and Gnostic and Esoteric Christianity as well as followers of Indian religions. Demographic survey data from 1999–2002 shows a significant minority of people from Europe and America, where there is reasonable freedom of thought and access to ideas but no outstanding recent reincarnationist tradition, believe we had a life before we were born, will survive death and be born again physically. The mean for the Nordic countries is 22%. The belief in reincarnation is particularly high in the Baltic countries, with Lithuania having the highest figure for the whole of Europe, 44%. The lowest figure is in East Germany, 12%. In Russia, about one-third believes in reincarnation. The effect of communist anti-religious ideas on the beliefs of the populations of Eastern Europe seems to have been rather slight, if any, except apparently in East Germany. Overall, 22% of respondents in Western Europe believe in reincarnation. According to a 2005 Gallup poll 20 percent of U.S. adults believe in reincarnation. Recent surveys by the Barna Group, a Christian research nonprofit organization, have found that a quarter of U.S. Christians, including 10 percent of all born again Christians, embrace the idea. 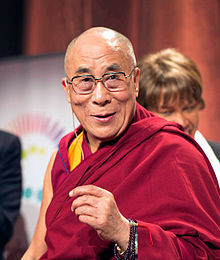 The 14th Dalai Lama has stated his belief that it would be difficult for science to disprove reincarnation. Skeptic Carl Sagan asked the Dalai Lama what he would do if a fundamental tenet of his religion (reincarnation) were definitively disproved by science. The Dalai Lama answered, "If science can disprove reincarnation, Tibetan Buddhism would abandon reincarnation… but it's going to be mighty hard to disprove reincarnation." Ian Stevenson reported that belief in reincarnation is held (with variations in details) by adherents of almost all major religions except Christianity and Islam. In addition, between 20 and 30 percent of persons in western countries who may be nominal Christians also believe in reincarnation. One 1999 study by Walter and Waterhouse reviewed the previous data on the level of reincarnation belief and performed a set of thirty in-depth interviews in Britain among people who did not belong to a religion advocating reincarnation. The authors reported that surveys have found about one fifth to one quarter of Europeans have some level of belief in reincarnation, with similar results found in the USA. In the interviewed group, the belief in the existence of this phenomenon appeared independent of their age, or the type of religion that these people belonged to, with most being Christians. The beliefs of this group also did not appear to contain any more than usual of "new age" ideas (broadly defined) and the authors interpreted their ideas on reincarnation as "one way of tackling issues of suffering", but noted that this seemed to have little effect on their private lives. Waterhouse also published a detailed discussion of beliefs expressed in the interviews. She noted that although most people "hold their belief in reincarnation quite lightly" and were unclear on the details of their ideas, personal experiences such as past-life memories and near-death experiences had influenced most believers, although only a few had direct experience of these phenomena. Waterhouse analyzed the influences of second-hand accounts of reincarnation, writing that most of the people in the survey had heard other people's accounts of past-lives from regression hypnosis and dreams and found these fascinating, feeling that there "must be something in it" if other people were having such experiences. Psychiatrist Ian Stevenson, from the University of Virginia, having grown up with a mother who was a theosophist, dedicated his latter career to investigating claims of reincarnation in hopes of providing evidence that reincarnation happens. Other people who have undertaken similar pursuits include Jim B. Tucker, Antonia Mills, Satwant Pasricha, Godwin Samararatne, and Erlendur Haraldsson, but Stevenson's publications remain the most well-known. Stevenson conducted more than 2,500 case studies of young children who claimed to remember past lives over a period of 40 years and published twelve books, including Twenty Cases Suggestive of Reincarnation, Reincarnation and Biology: A Contribution to the Etiology of Birthmarks and Birth Defects, a two-part monograph and Where Reincarnation and Biology Intersect. He documented the family's and child's statements along with correlates to a deceased person he believed matched the child's memory. Stevenson also claimed that some birthmarks and birth defects matched wounds and scars on the deceased, sometimes providing medical records like autopsy photographs to make his case. Expecting controversy and skepticism, Stevenson also searched for disconfirming evidence and alternative explanations for the reports, but he argued (not without criticism) that his methods ruled out all possible "normal" explanations for the child’s memories. Stevenson's work in this regard was impressive enough to Carl Sagan that he referred to what was apparently Stevenson's investigations in his book The Demon-Haunted World as an example of carefully collected empirical data, though he rejected reincarnation as a parsimonious explanation for the stories. Sam Harris cited Stevenson's works in his book The End of Faith as part of a body of data that seems to attest to the reality of psychic phenomena. Critical reviews of these claims include work by Paul Edwards who criticized the accounts of reincarnation as being purely anecdotal and cherry-picked. Instead, Edwards says such stories are attributable to selective thinking, suggestion, and false memories that can result from the family's or researcher's belief systems, and thus cannot be counted as empirical evidence. The philosopher Keith Augustine wrote in critique that the fact that "the vast majority of Stevenson's cases come from countries where a religious belief in reincarnation is strong, and rarely elsewhere, seems to indicate that cultural conditioning (rather than reincarnation) generates claims of spontaneous past-life memories." Further, Ian Wilson pointed out that a large number of Stevenson’s cases consisted of poor children remembering wealthy lives or belonging to a higher caste. In these societies, claims of reincarnation are sometimes used as schemes to obtain money from the richer families of alleged former incarnations. Following these types of criticism, Stevenson published a book on European Cases of the Reincarnation Type in attempt to show the reports were cross-cultural. Even still, Robert Baker asserted that all the past-life experiences investigated by Stevenson and other parapsychologists are understandable in terms of known psychological factors including a mixture of cryptomnesia and confabulation. Edwards also objected that reincarnation invokes assumptions that are inconsistent with modern science. As the vast majority of people do not remember previous lives and there is no empirically documented mechanism known that allows personality to survive death and travel to another body, positing the existence of reincarnation is subject to the principle that "extraordinary claims require extraordinary evidence". Researchers such as Stevenson acknowledged these limitations. Stevenson also claimed there were a handful of cases that suggested evidence of xenoglossy, including two where a subject under hypnosis allegedly conversed with people speaking the foreign language, instead of merely being able to recite foreign words. Sarah Thomason, a linguist (and skeptical researcher) at the University of Michigan, reanalyzed these cases, concluding that "the linguistic evidence is too weak to provide support for the claims of xenoglossy." ^ a b c d Mark Juergensmeyer & Wade Clark Roof 2011, pp. 271–272. ^ a b c Stephen J. Laumakis 2008, pp. 90–99. ^ Oxford Dictionaries (2016). "Transmigration". Oxford University Press. ^ "Encyclopædia Britannica". Concise.britannica.com. Retrieved 2016-06-25. ^ a b Keown 2013, pp. 35–40. ^ Christopher Key Chapple (2006). Jainism and Ecology: Nonviolence in the Web of Life. Motilal Banarsidass. p. 39. ISBN 978-81-208-2045-6. ^ Karl Sigmund. "Gödel Exhibition: Gödel's Century". Goedelexhibition.at. Retrieved 2011-12-06. ^ "Heart of Hinduism: Reincarnation and Samsara". Hinduism.iskcon.com. Archived from the original on 2011-04-19. Retrieved 2011-12-06. ^ a b Monier Monier-Williams (1872). A Sanskrit-English Dictionary. Oxford University Press. p. 582. ^ Ronald Wesley Neufeldt (1986). Karma and Rebirth: Post Classical Developments. State University of New York Press. pp. 88–89. ISBN 978-0-87395-990-2. ^ Thomas William Rhys Davids; William Stede (1921). Pali-English Dictionary. Motilal Banarsidass. pp. 95, 144, 151, 361, 475. ISBN 978-81-208-1144-7. ^ John Bowker 2014, pp. 84–85. ^ Obeyesekere 2005, p. 1-2, 108, 126–128. ^ Mark Juergensmeyer & Wade Clark Roof 2011, pp. 272–273. ^ Irving Steiger Cooper (1920). Reincarnation: The Hope of the World. Theosophical Society in America. p. 15. ^ Diodorus Siculus thought the Druids might have been influenced by the teachings of Pythagoras. Diodorus Siculus v.28.6; Hippolytus Philosophumena i.25. ^ Flood, Gavin. Olivelle, Patrick. 2003. The Blackwell Companion to Hinduism. Malden: Blackwell. pg. 273-4. "The second half of the first millennium BCE was the period that created many of the ideological and institutional elements that characterize later Indian religions. The renouncer tradition played a central role during this formative period of Indian religious history....Some of the fundamental values and beliefs that we generally associate with Indian religions in general and Hinduism in particular were in part the creation of the renouncer tradition. These include the two pillars of Indian theologies: samsara – the belief that life in this world is one of suffering and subject to repeated deaths and births (rebirth); moksa/nirvana – the goal of human existence....."
^ Gavin D. Flood, An Introduction to Hinduism, Cambridge University Press (1996), UK ISBN 0-521-43878-0 p. 86 – "A third alternative is that the origin of transmigration theory lies outside of vedic or sramana traditions in the tribal religions of the Ganges valley, or even in Dravidian traditions of south India." ^ Grimes, John A. (1996). A Concise Dictionary of Indian Philosophy: Sanskrit Terms Defined in English. State University of New York Press. ISBN 9780791430682. LCCN 96012383. ^ Jamison, Stephanie; Witzel, Michael (1992). "Vedic Hinduism" (PDF). Harvard University. pp. 2–4. Retrieved 2019-01-23. ^ Stephen J. Laumakis 2008, p. 90. ^ a b Padmanabh Jaini 1980, pp. 217–236. ^ a b c d Paul Dundas (2003). The Jains. Routledge. pp. 14–16, 102–105. ISBN 978-0415266055. ^ Kristi L. Wiley (2009). The A to Z of Jainism. Scarecrow. p. 186. ISBN 978-0-8108-6337-8. ^ Paul Dundas (2003). The Jains. Routledge. pp. 104–105. ISBN 978-0415266055. ^ John E. Cort (2001). Jains in the World: Religious Values and Ideology in India. Oxford University Press. pp. 118–119. ISBN 978-0-19-803037-9. ^ a b c d e Jeff Wilson (2010). Saṃsāra and Rebirth, in Buddhism. Oxford University Press. doi:10.1093/obo/9780195393521-0141. ISBN 9780195393521. ^ a b Kevin Trainor (2004). Buddhism: The Illustrated Guide. Oxford University Press. pp. 62–63. ISBN 978-0-19-517398-7. ; Quote: "Buddhist doctrine holds that until they realize nirvana, beings are bound to undergo rebirth and redeath due to their having acted out of ignorance and desire, thereby producing the seeds of karma". ^ Paul Williams, Anthony Tribe, Buddhist thought: a complete introduction to the Indian tradition. Routledge, 2000, page 84. ^ a b Merv Fowler (1999). Buddhism: Beliefs and Practices. Sussex Academic Press. p. 65. ISBN 978-1-898723-66-0. , Quote: "For a vast majority of Buddhists in Theravadin countries, however, the order of monks is seen by lay Buddhists as a means of gaining the most merit in the hope of accumulating good karma for a better rebirth." ^ James Hastings; John Alexander Selbie; Louis Herbert Gray (1922). Volume 12: Suffering-Zwingli. Encyclopædia of Religion and Ethics. T. & T. Clark. pp. 616–618. ^ Jessica Frazier & Gavin Flood 2011, pp. 84–86. ^ Jessica Frazier; Gavin Flood (2011). The Continuum Companion to Hindu Studies. Bloomsbury Academic. pp. 84–86. ISBN 978-0-8264-9966-0. ^ Yuvraj Krishan (1997). The Doctrine of Karma: Its Origin and Development in Brāhmaṇical, Buddhist, and Jaina Traditions. Bharatiya Vidya Bhavan. pp. 17–27. ISBN 978-81-208-1233-8. ^ Damien Keown (2013). Buddhism: A Very Short Introduction. Oxford University Press. pp. 28, 32–38. ISBN 978-0-19-966383-5. ^ Michael D. Coogan (2003). The Illustrated Guide to World Religions. Oxford University Press. p. 192. ISBN 978-0-19-521997-5. ^ David Carpenter; Ian Whicher (2003). Yoga: The Indian Tradition. Routledge. p. 116. ISBN 978-1-135-79606-8. ^ Rita Langer (2007). Buddhist Rituals of Death and Rebirth: Contemporary Sri Lankan Practice and Its Origins. Routledge. pp. 53–54. ISBN 978-1-134-15873-7. ^ [a] Christmas Humphreys (2012). Exploring Buddhism. Routledge. pp. 42–43. ISBN 978-1-136-22877-3. [b] Brian Morris (2006). Religion and Anthropology: A Critical Introduction. Cambridge University Press. p. 51. ISBN 978-0-521-85241-8. , Quote: "(...) anatta is the doctrine of non-self, and is an extreme empiricist doctrine that holds that the notion of an unchanging permanent self is a fiction and has no reality. According to Buddhist doctrine, the individual person consists of five skandhas or heaps – the body, feelings, perceptions, impulses and consciousness. The belief in a self or soul, over these five skandhas, is illusory and the cause of suffering." ^ Bruce M. Sullivan (1997). Historical Dictionary of Hinduism. Scarecrow. pp. 235–236 (See: Upanishads). ISBN 978-0-8108-3327-2. ^ Klaus K. Klostermaier (2007). A Survey of Hinduism: Third Edition. State University of New York Press. pp. 119–122, 162–180, 194–195. ISBN 978-0-7914-7082-4. ^ Kalupahana 1992, pp. 38-39. ^ G Obeyesekere (1980). Wendy Doniger (ed.). Karma and Rebirth in Classical Indian Traditions. University of California Press. pp. 137–141. ISBN 978-0-520-03923-0. ^ Libby Ahluwalia (2008). Understanding Philosophy of Religion. Folens. pp. 243–249. ISBN 978-1-85008-274-3. ^ Harold Coward; Julius Lipner; Katherine K. Young (1989). Hindu Ethics. State University of New York Press. pp. 85–94. ISBN 978-0-88706-764-8. ^ a b Naomi Appleton (2014). Narrating Karma and Rebirth: Buddhist and Jain Multi-Life Stories. Cambridge University Press. pp. 76–89. ISBN 978-1-139-91640-0. ^ Kristi L. Wiley (2004). Historical Dictionary of Jainism. Scarecrow. p. 91. ISBN 978-0-8108-5051-4. ^ Kristi L. Wiley (2004). Historical Dictionary of Jainism. Scarecrow. pp. 10–12, 111–112, 119. ISBN 978-0-8108-5051-4. Kristi L. Wiley (2004). Historical Dictionary of Jainism. Scarecrow. pp. 118–119. ISBN 978-0-8108-5051-4. ^ John E. Cort (2001). Jains in the World: Religious Values and Ideology in India. Oxford University Press. pp. 118���123. ISBN 978-0-19-803037-9. ^ Lucian, Gallus, 18 et seq. ^ Virgil, The Aeneid, vv. 724 et seq. ^ Much of this is documented in R.E. Slater's book Paradise Reconsidered. ^ Chuang Tzŭ: Mystic, Moralist, and Social Reformer (translated by Herbert Allen Giles). 1889. p. 304. ^ "Newadvent.org". Newadvent.org. 1911-02-01. Retrieved 2011-12-06. ^ "Newadvent.org". Newadvent.org. 1907-03-01. Retrieved 2011-12-06. ^ "the souls must always be the same, for if none be destroyed they will not diminish in number." Republic X, 611. The Republic of Plato By Plato, Benjamin Jowett Edition: 3 Published by Clarendon press, 1888. ^ a b Berger, Arthur S.; Berger, Joyce (1991). The Encyclopedia of Parapsychology and Psychical Research. Paragon House Publishers. ISBN 1-55778-043-9. ^ a b "Shirleymaclaine.com". Shirleymaclaine.com. Archived from the original on 2011-11-06. Retrieved 2011-12-06. ^ Richmal Crompton, More William, George Newnes, London, 1924, XIII. William and the Ancient Souls; "The memory usually came in a flash. For instance, you might remember in a flash when you were looking at a box of matches that you had been Guy Fawkes." ^ a b Mark Juergensmeyer & Wade Clark Roof 2011, p. 272. ^ a b Jeaneane D. Fowler 1997, p. 10. ^ a b Julius Lipner (2012). Hindus: Their Religious Beliefs and Practices. Routledge. pp. 263–265. ISBN 978-1-135-24061-5. ^ Jacobsen, Knut A. "Three Functions Of Hell In The Hindu Traditions." Numen 56.2–3 (2009): 385–400. ATLA Religion Database with ATLASerials. Web. 16 Sept. 2012. ^ Julius Lipner (2012). Hindus: Their Religious Beliefs and Practices. Routledge. pp. 251–252, 283, 366–369. ISBN 978-1-135-24061-5. ^ Roy W. Perrett (1998). Hindu Ethics: A Philosophical Study. University of Hawaii Press. pp. 53–54. ISBN 978-0-8248-2085-5. ^ Bruce M. Sullivan (2001). The A to Z of Hinduism. Rowman & Littlefield. p. 137. ISBN 978-0-8108-4070-6. ^ Harold Coward 2008, pp. 129, also see pages 130–155. ^ Chapple 2010, p. 98. ^ Chapple 2010, p. 107. ^ Chapple 2010, p. 582. ^ Loy, David (1982). "Enlightenment in Buddhism and Advaita Vedanta: Are Nirvana and Moksha the Same?". International Philosophical Quarterly. 22 (1): 65–74. doi:10.5840/ipq19822217. ^ a b c Peter Harvey (2012). An Introduction to Buddhism: Teachings, History and Practices. Cambridge University Press. pp. 32–33, 38–39, 46–49. ISBN 978-0-521-85942-4. ^ Ronald Wesley Neufeldt (1986). Karma and Rebirth: Post Classical Developments. State University of New York Press. pp. 123–131. ISBN 978-0-87395-990-2. ^ Ray Billington (2002). Understanding Eastern Philosophy. Routledge. p. 60. ISBN 978-1-134-79348-8. ^ Ray Billington (2002). Understanding Eastern Philosophy. Routledge. pp. 43–44, 58–60. ISBN 978-1-134-79349-5. ^ a b Damien Keown (2004). A Dictionary of Buddhism (Articles titled ucchedavāda, śāśvata-vāda, rebirth). Oxford University Press. pp. 80, 162, 225, 255, 315. ISBN 978-0198605607. ^ Norman C. McClelland (2010). Encyclopedia of Reincarnation and Karma. McFarland. p. 21. ISBN 978-0-7864-5675-8. ^ David J. Kalupahana (1975). Causality: The Central Philosophy of Buddhism. University Press of Hawaii. pp. 115–119. ISBN 978-0-8248-0298-1. ^ Oliver Leaman (2002). Eastern Philosophy: Key Readings. Routledge. pp. 23–27. ISBN 978-1-134-68919-4. ^ Malcolm B. Hamilton (12 June 2012). The Sociology of Religion: Theoretical and Comparative Perspectives. Routledge. pp. 73–80. ISBN 978-1-134-97626-3. ^ Raju, P. T. (1985). Structural Depths of Indian Thought. State University of New York Press. pp. 147–151. ISBN 978-0-88706-139-4. Hugh Nicholson (2016). The Spirit of Contradiction in Christianity and Buddhism. Oxford University Press. pp. 23–25. ISBN 978-0-19-045534-7. ^ Rahula, Walpola (1990). What the Buddha Taught. London: Gordon Fraser. p. 51. ^ Trainor 2004, p. 58, Quote: "Buddhism shares with Hinduism the doctrine of Samsara, whereby all beings pass through an unceasing cycle of birth, death and rebirth until they find a means of liberation from the cycle. However, Buddhism differs from Hinduism in rejecting the assertion that every human being possesses a changeless soul which constitutes his or her ultimate identity, and which transmigrates from one incarnation to the next..
^ David J. Kalupahana (1975). Causality: The Central Philosophy of Buddhism. University Press of Hawaii. p. 83. ISBN 978-0-8248-0298-1. ^ William H. Swatos; Peter Kivisto (1998). Encyclopedia of Religion and Society. Rowman Altamira. p. 66. ISBN 978-0-7619-8956-1. ^ Peter Harvey, The Selfless Mind. Curzon Press 1995, page 247. ^ Robert E. Buswell Jr.; Donald S. Lopez Jr. (2013). The Princeton Dictionary of Buddhism. Princeton University Press. pp. 49–50, 708–709. ISBN 978-1-4008-4805-8. ^ Karma-gliṅ-pa; Chogyam Trungpa; Francesca Fremantle (2000). The Tibetan Book of the Dead: The Great Liberation Through Hearing in the Bardo. Shambhala Publications. pp. xi, xvii–xxiii. ISBN 978-1-57062-747-7. ^ Karma-gliṅ-pa; Chogyam Trungpa; Francesca Fremantle (2000). The Tibetan Book of the Dead: The Great Liberation Through Hearing in the Bardo. Shambhala Publications. pp. 4–23. ISBN 978-1-57062-747-7. ^ Trainor 2004, pp. 210–211. ^ Trainor 2004, pp. 62–63. ^ Padmanabh Jaini 1980, pp. 226–228. ^ a b Krishan, Yuvraj (1997): p. 43. ^ The Jain hierarchy of life classifies living beings on the basis of the senses: five-sensed beings like humans and animals are at the top, and single sensed beings like microbes and plants are at the bottom. ^ Tikunei Zohar, Tikkun 69, 112a and 114a. Literally, "There is an extension of Moses in every generation and to each and every righteous man." ^ "Limmud Bay Area 2016: Judaism and Reincarnation". limmudbayarea2016.sched.com. Retrieved 2017-02-22. ^ W.O. Cole; Piara Singh Sambhi (2016). Sikhism and Christianity: A Comparative Study. Springer. pp. 13–14. ISBN 978-1-349-23049-5. ^ a b c d Arvind-Pal Singh Mandair (2013). Sikhism: A Guide for the Perplexed. A&C Black. pp. 145–147. ISBN 978-1-4411-0231-7. ^ John Gordon Melton; Martin Baumann (2002). Religions of the world: a comprehensive encyclopedia of beliefs and practices. 2. ABC-CLIO. p. 632. ISBN 978-1-57607-223-3. ^ Eric J. Lott (1988). Vision, Tradition, Interpretation: Theology, Religion, and the Study of Religion. Walter de Gruyter. pp. 49–53. ISBN 978-3-11-009761-0. ^ Flood, Gavin (1996). An introduction to Hinduism. Cambridge University Press. p. 137. ISBN 978-0-521-43878-0. ^ Antonia Mills and Richard Slobodin, ed. (1994). Amerindian Rebirth: Reincarnation Belief Among North American Indians and Inuit. University of Toronto Press. ISBN 978-0802077035. ^ Rink, Henry. "Tales and Traditions of the Eskimo". adapted by Weimer, Christopher, M. Retrieved 1 December 2011. ^ Jefferson, Warren (2008). Reincarnation beliefs of North American Indians : soul journeys, metamorphoses, and near-death experiences. Native Voices. ISBN 1-57067-212-1. ^ ANALYSIS December 9, 2009 (2009-12-09). "Pewforum.org". Pewforum.org. Retrieved 2011-12-06. ^ "Spiritual-wholeness.org". Spiritual-wholeness.org. Archived from the original on 2001-04-25. Retrieved 2011-12-06. ^ Cranston, Sylvia. Reincarnation in Christianity: A New Vision of the Role of Rebirth in Christian Thought (Quest Books) (9780835605014): Geddes MacGregor: Books. Amazon.com. ISBN 0835605019. ^ a b c "Church Fathers: Letter 124 (Jerome)". ^ a b "Hieronymus_Stridonensis_cps2, Epistolae, 124, p0". ^ a b Cross, F. L., and Elizabeth A. Livingstone. The Oxford Dictionary of the Christian Church (Second Edition). New York: Oxford University Press, 1984. p. 1009. ^ Agustine of Hippo (1913). The city of God. Book 12, chapter 20. archive.org. I. Translated by Marcus Dods. Edinburgh. pp. 508–509. Archived from the original on 2018-12-25. Retrieved 2018-12-25. ^ a b c Jane Idelman Smith; Yvonne Yazbeck Haddad (2002). The Islamic Understanding of Death and Resurrection. Oxford University Press. pp. 23–24. ISBN 978-0-19-028880-8. ^ a b c Norman C. McClelland 2010, pp. 122–123. ^ John L. Esposito (2004). The Oxford Dictionary of Islam. Oxford University Press. pp. 137, 249. ISBN 978-0-19-975726-8. ^ Norman L. Geisler; Abdul Saleeb (2002). Answering Islam: The Crescent in Light of the Cross. Baker Academic. p. 109. ISBN 978-0-8010-6430-2. ^ Norman C. McClelland 2010, pp. 122-123. ^ Peters, Francis E.; Esposito, John L. (2006). The children of Abraham: Judaism, Christianity, Islam. Princeton University Press. ISBN 978-0-691-12769-9. ^ Alawis, Countrystudies.us, U.S. Library of Congress. ^ Lewis, James (2002). The Encyclopedia of Cults, Sects, and New Religions. Prometheus Books. ISBN 1615927387. ^ David J. Hess (1 November 2010). Spirits and Scientists: Ideology, Spiritism and Brazilian Culture. Pennsylvania State University Press. pp. 16–. ISBN 978-0-271-04080-6. ^ "Theosophy and reincarnation". Blavatskytrust.org.uk. Retrieved 2011-12-06. ^ Steven Forrest and Jeffrey Wolf Green. "About Evolutionary Astrology". Retrieved 2014-11-22. ^ "Scientology Church & Religion – What is Scientology?". Scientology. Archived from the original on 2006-06-13. ^ Baba, Meher (1967), Discourses, Volume III, Sufism Reoriented, 1967, ISBN 1-880619-09-1, p. 96. ^ a b c "Popular psychology, belief in life after death and reincarnation in the Nordic countries, Western and Eastern Europe" (PDF). Retrieved 2011-12-06. ^ Jane Henry (2005). Parapsychology: research on exceptional experiences Routledge, p. 224. ^ Walter, T.; Waterhouse, H. (1999). "A very private belief: Reincarnation in contemporary England". Sociology of Religion. 60 (2): 187–197. doi:10.2307/3711748. JSTOR 3711748. Archived from the original on 2005-06-27. Retrieved 2009-06-25. ^ Waterhouse, H. (1999). "Reincarnation belief in Britain: New age orientation or mainstream option?". Journal of Contemporary Religion. 14 (1): 97–109. doi:10.1080/13537909908580854. Retrieved 2009-06-26. ^ "Stevenson 2006" (PDF). Archived from the original (PDF) on July 21, 2006. Retrieved September 1, 2016. , pp. 13–14. ^ "Mills". Signs of Reincarnation. ^ Cadoret, Remi. Book Review: European Cases of the Reincarnation Type The American Journal of Psychiatry, April 2005. ^ Sagan, Carl (1996). Demon Haunted World. Random House. p. 300. ISBN 978-0-394-53512-8. ^ Harris, Sam (September 17, 2005). The End of Faith (Reprint ed.). W. W. Norton. p. 41. ISBN 0393327655. ^ Rockley, Richard. (2002). "Book Review: Children who Remember Previous Lives". SkepticReport. Retrieved 2014-10-11. ^ Cogan, Robert. (1998). Critical Thinking: Step by Step. University Press of America. pp. 202–203. ISBN 0-7618-1067-6 "Edwards catalogs common sense objections which have been made against reincarnation. 1) How does a soul exist between bodies? 2) Tertullian's objection: If there is reincarnation, why are not babies born with the mental abilities of adults? 3) Reincarnation claims an infinite series of prior incarnations. Evolution teaches that there was a time when humans did not yet exist. So reincarnation is inconsistent with modern science. 4) If there is reincarnation, then what is happening when the population increases? 5) If there is reincarnation, then why do so few, if any people, remember past lives?... To answer these objections believers in reincarnation must accept additional assumptions... Acceptance of these silly assumptions, Edwards says, amounts to a crucifixion of one's intellect." ^ Shroder, Tom (2007-02-11). "Ian Stevenson; Sought To Document Memories Of Past Lives in Children". Washingtonpost.com. Retrieved 2011-12-06. Chapple, Christopher Key, W Sargeant (Translator) (2010). The Bhagavad Gita: Twenty-fifth–Anniversary Edition. State University of New York Press. ISBN 978-1-4384-2840-6. Trainor, Kevin (2004). Buddhism: The Illustrated Guide. Oxford University Press. ISBN 978-0-19-517398-7. Baba, Meher, Discourses, Sufism Reoriented, 1967, ISBN 1-880619-09-1. Besant, A.W., Reincarnation, Published by Theosophical Pub. Society, 1892. Boulting, W. Giordano Bruno, His Life, Thought, and Martyrdom, London: Kegan Paul, 1914. Bowman, Carol, Children's Past Lives, 1998, ISBN 0-553-57485-X. Doniger O'Flaherty, Wendy (1980). Karma and Rebirth in Classical Indian Traditions. University of California Press. ISBN 0-520-03923-8. Edwards, Paul, Reincarnation: A Critical Examination ISBN 1-57392-921-2. Foltz, Richard, Religions of the Silk Road, New York: Palgrave Macmillan, 2010, ISBN 978-0-230-62125-1. Gyatso, Geshe Kelsang, Joyful Path of Good Fortune, pp 336–47, Tharpa Publications (2nd. ed., 1995) ISBN 978-0-948006-46-3. Gyatso, Geshe Kelsang, Living Meaningfully, Dying Joyfully: The Profound Practice of Transference of Consciousness, Tharpa Publications (1999) ISBN 978-0-948006-63-0. Head, Joseph and Cranston, S.L., editors, Reincarnation: The Phoenix Fire Mystery, 1994, ISBN 0-517-56101-8. Jefferson, Warren. 2009. “Reincarnation Beliefs of North American Indians: Soul Journeys, Metamorphoses, and Near-Death Experiences.” Summertown, TN: Native Voices. ISBN 978-1-57067-212-5. Heindel, Max, The Rosicrucian Cosmo-Conception (Part I, Chapter IV: Rebirth and the Law of Consequence), 1909, ISBN 0-911274-34-0. Emily Williams Kelly, Science, the Self, and Survival after Death, Rowman, 2012. Nikhilananda, Swami. Gospel of Sri Ramakrishna, (8th Ed. 1992) ISBN 0-911206-01-9. Rinehart, Robin, ed., Contemporary Hinduism, (2004). Steinpach, Richard, Hidden Connections Determine Our Earth-Life, 1988, ISBN 1-57461-013-9. Taylor, Michael, "Master of the Rose", Comstar Media LLC, 1997–2007, ISBN 1-933866-07-1. Tucker, Jim (2005). Life Before Life: A Scientific Investigation of Children's Memories of Previous Lives, ISBN 0-312-32137-6. Weiss, Brian L., Only Love is real: the story of soulmates reunited, 1996, ISBN 0-446-51945-6.